Late last year Altura created a checking account for 18-24 year olds and we helped them brand it as iChecking. As great of a product as iChecking is, 18-24 year olds don’t have much natural interest in financial products. So, we created a contest – sponsored by Altura and iChecking – that will give one lucky Taylor Swift fan a chance to meet the Grammy-winning star. Then we created a radio, outdoor, print & web campaign that promoted the contest and tied together iChecking and Taylor Swift. 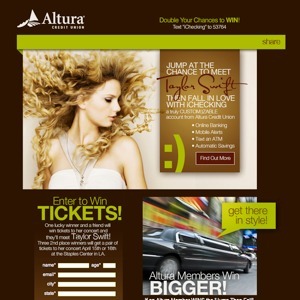 To prove that it worked, we funneled the Taylor fans to text messages and a custom-built website, both of which are hooked to advanced tracking software so Altura can see exactly what our campaign did for them.